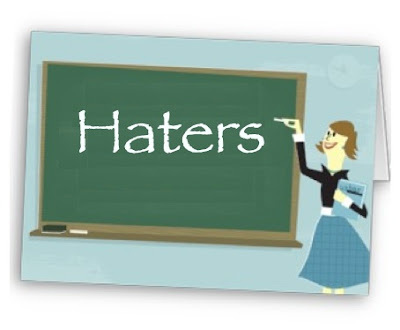 HATER (noun): a person who has nothing nice to say, someone who criticizes everyone and everything. Don’t be such a HATER! Just because you don’t like this style of music, doesn’t mean it’s bad. Show your friends! SHARE it on your wall! Use it in a sentence below! Do you like our YouTube videos? Would you like to practice the things you have learned from them? Log-in to our “Members Only” section using Facebook, and you will receive access to FREE Lessons based on our videos, with audio files to practice pronunciation, exercises, answers and more! When you’re ready for private English lessons by Skype with one of our live teachers, click here to Learn English Online today!